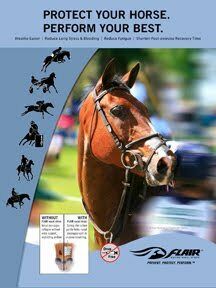 Elkton, MD - The Dansko Fair Hill International kicked off the last chapter of the 2010 eventing season, with the USEF National CCI2* and CCI3* Eventing Championships. With many competitors and staff still shaking off the effects of a month of World Equestrian Games activities, Fair Hill International provided some welcome relief in the Maryland countryside. The USEF National CCI2* Eventing Championship got underway on Thursday, and Clark Montgomery set the standard with Loughan Glen, storming to the lead with a score of 45.3 on a day which featured nasty weather conditions and plenty of wind and rain. Montgomery, who is based at Carl Bouckaert's Farm in Chattahoochee Hills, GA fended off 28 more CCI2* rides on Friday and kept a hold of his lead. "I was lucky to go early," said Montgomery. "He's a seven year old, we got him two years ago from Ireland. He's the sweetest horse, he's pretty reliable, especially at show. He wants leg so I can go in the ring and go for it and the judges like that. He's a big horse and he is still developing." Holly Becker and Kathryn Kraft own Loughan Glen. Montgomery also sits fourth on Universe (owned by Clark's wife Jessica, who produced him to the Preliminary level) with a score of 49.2, he is tied with Mara Dean and Fun Maker. Splitting Montgomery's horses are the overnight second and third place pairs from Thursday. Erin Sylvester put in a strong effort with No Boundaries, her own nine-year-old Thoroughbred cross gelding, to finish second on a score of 47.8 which included an error of course in the test. "My horse was great," said Sylvester. "He's a bit young, it's his first year at Intermediate and his first CCI2*. I have been getting a lot of help from Silva Martin and I just went out and held on yesterday and he was great. I think the rain was fine, it wasn't that heavy it really wasn't too bad it made my horse very forward and it all worked out ok."
Sylvester is a local rider, living just over the Pennsylvania border in Unionville, she runs a very successful riding school and trains with Silva and Boyd Martin. Sylvester is doing double duty as an owner this week, as Boyd Martin, fresh from the World Equestrian Games (and last year's CCI3* winner at Fair Hill International), took over the reins of Armani for the CCI3*. "(Boyd's riding) to give my three-star horse a better ride. I've been having a little bit of trouble with him," said Sylvester. "Boyd knows him very well, he hasn't competed him but he's jumped him a lot and I think he better prepared to ride him around a CCI3* right now." In the CCI3* Nate Chambers (Reston, VA) took a commanding lead with Rolling Stone II on a score of 46.6 putting in the most polished performance of the day. The 14-year-old Hessen gelding stayed relaxed and attentive in blustery conditions that for some horses were just too much to handle. year: excelling on the first day. "I was very happy with it," said Chambers. "The wind has certainly been causing a little bit of trouble. But Rolly is always really well behaved. One he knows his job and two he enjoys it, which is nice. He's a lot of fun to ride." Chambers feels confident about the first two phases but knows that if he keeps his top position going into Sunday, he will have his work cut out for him. 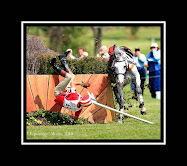 "He's been doing quite well in the dressage all year but I am having some issues with my show jumping," said Chambers. "I went and got a desk job instead of doing this professionally and he is the only horse I ride a day and my show jumping is suffering a little as a result." Chambers hopes to put those demons to rest on Sunday as well as an unpleasant experience on the cross country at last year's CCI3*. "I would obviously like to have a much better round last year," said Chambers, who was pulled up on course after his horse suddenly ran out of energy. "He had a lung infection and with the weather conditions he ran out of energy very, very quickly. I obviously wished I pulled up sooner." But with the health problems behind him, Rolling Stone has thrived all year on the cross country. Rolling Stone has jumped double clear at every single competition in 2010, so Chambers is looking forward to tomorrow's cross country challenge. Hannah Burnett, who won the USEF National CCI2* Championship in 2009, was the only other rider to get break 50 in the CCI3*. With a score of 49.4 she is in a good spot to have another winning effort at Fair Hill International with Richard Thompson's St Barths. "I was obviously worried last night when I heard the forecast with the wind," said Burnett about the nine-year-old. "He's a little chestnut Thoroughbred and he can be hot. I only rode him twice before his final warm up, and usually for him I would ride him three or four times. I was really happy with him. I didn't realize how much the tent was flapping until I went around the ring. It flapped really loud right before I went down the centerline so I veered off and did a five meter circle. He quieted down and went right to work and I was really proud of him." Molly Rosin was fourth in the the CCI2* in 2008 at Fair Hill International and she put in a very confident effort with Havarah's Charly (a Hungarian Warmblood owned by the Minyan Syndicate) to sit third going into the cross country. Another local, the pair is based in Baltimore. Their score of 51.8 included an error because Rosin carried her whip around the outside of the arena, there is a new FEI rule which prohibits this. "I was really pleased with him," said Rosin. "To take Charly into a big ring like that with atmosphere - I was pretty proud of him for keeping on task as much as he did. He's been going so well on the flat and I'm really excited."